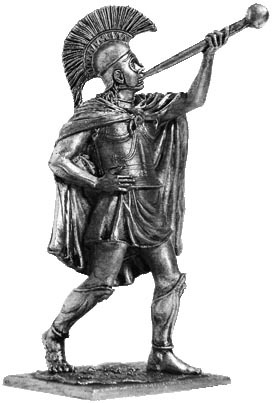 Military trumpeters-signalers were an integral part of Greek troops. Warriors hoplites fought organized systems (phalanx), which meant strict discipline and coherence. Command phalanx during the battle was not easy. Warriors who wore helmets, could simply not hear the orders of the strong noise. Signals for the offensive, attack and retreat filed by military pipe and the rate of movement was supported by the flute. Signals can be used as a stratagem. Filing a false signal to the breakfast, we managed to lull the enemy and catch him off guard. At an early trumpeter of bronze armor "Bell" type, which was popular back in the 08/06 centuries BC On his helmet Chalcis type, which appeared in the early 6 century BC. Crest of horsehair sometimes stained, but more often used natural - black, white and brown color. Legs reserved Bronze Leggings and shoulders thrown traditional Greek cloak (mantle). Pipe, probably made of wood and held his lips with a leather strap. In ancient Greece, music, singing and dancing were largely aimed at raising the qualities needed soldiers. Warlike music was supposed to bring courage and bravery. Warriors and athletes have practiced physical exercises and military training to the sounds of wind instruments.